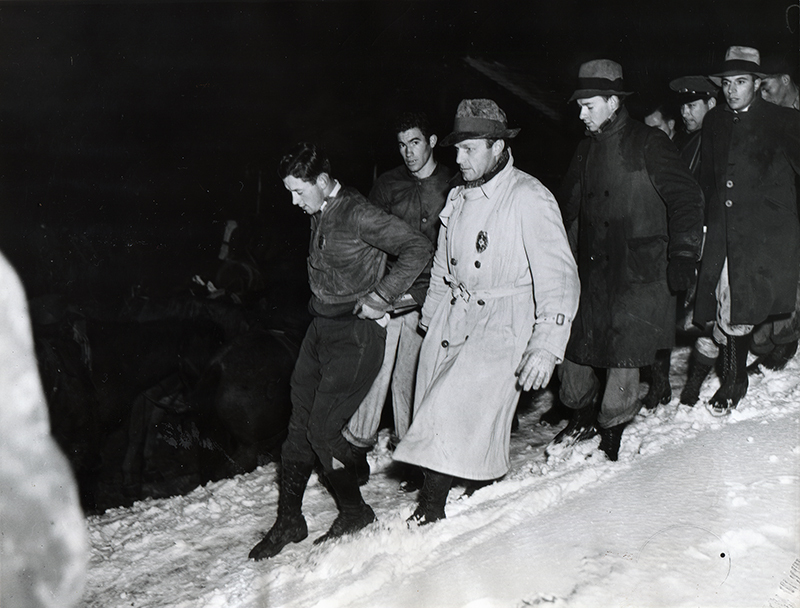 January 13, 1937 — A victim, possibly a survivor, is carried down snowy Iron Mountain at the Santa Clara Divide south of Newhall following the previous day's fatal crash of Western Air Express Flight 7 out of Salt Lake City. Acme wire photo, 7x9-inch glossy, distributed by Newspaper Enterprise Assn. (NEA). This print apparently published in the Los Angeles Illustrated Daily News, which was in operation from 1923 to 1954 when it was sold to the Chandlers and absorbed into the Los Angeles Mirror. Victims of the airplane crash near Newhall, California were transported to various hospitals early this morning over trails that wound among the snow-covered hills. Photo shows stretcher bearers carrying one of the [many?] victims down the trail to waiting wagons. Five of the 13 people on board Western Air Express Flight 7 out of Salt Lake City died as a result injuries when their Boeing 247-D slammed into Pinetos Peak at the Santa Clara Divide south of Newhall on Jan. 12, 1937. It was the second fatal crash of a commercial airliner in the vicinity within three weeks. James A. Braden, president of Braden-Sutphin Ink Co., in Cleveland, was crushed between two seats and died instantly. Braden was sitting near Martin Johnson, who died at a hospital the next day from a fractured skull (probably traumatic brain injury). Johnson was a popular adventurer, big-game hunter, author and documentary filmmaker. Initial news reports said only Johnson and Braden died, and that the other 11 survived (see The Associated Press, ACME wire photo service, The Newhall Signal). However, the official crash report (and subsequent listings) show a total of five casualties including copilot Clifford P. Owens of Burbank, E.E. Spencer (alternately D.E. Spencer) of Stromberg Electric Co. of Chicago, and an A.L. Loomis of Omaha. Spencer sustained critical head injuries; Owens and Loomis were also listed in critical condition after the crash. It is not known how long the three lingered before they succumbed to their injuries. In addition to Johnson's wife, Osa, there was at least one other rather well-known survivor: Robert T. Andersen, son of Pea Soup Andersen's restaurant founders Anton and Juliette Andersen. A Stanford graduate, Robert created the billboards for which the restaurant became known. According to initial news reports and the official crash report, after stopping in Las Vegas, pilot William. W. Lewis lost sight of the Saugus beam on approach to Burbank airport in the fog. It may have been snowing. (AP said it was; see snow and ice in crash-scene photos). Lewis cut his engines and, at 11:15 a.m., attempted a "pancake" landing on the side of Iron Mountain, south of Placerita Canyon on the Mendenhall Ridge along the Santa Clara Divide — midway between Newhall and what was identified as the "lookout tower," presumably Los Angeles County Fire Department Camp 9. "While overflying Saugus at 5,200 feet, aircraft was already 300 feet too low," the official crash report states (spelling corrected). "Pilot tried to contact (air traffic control) without any success. Due to low visibility caused by fog, pilot did not realize he was flying at an insufficient altitude. In a descent rate of 525 feet per minute, aircraft hit Pinetos Peak." Longtime Placerita/Sand Canyon resident George Starbuck remembers: "Three of my uncles were the first ones to the scene, Ray, Charles and Edward Walker. They heard the plane go over and the sound of the crash. It was directly south of the upper house in Placerita. My grandfather drove down to Newhall to inform the sheriff and rescue crew. From what I remember, both of the Johnsons, Africa adventure film makers, were on board. Osa Johnson survived" (personal communication 1-13-2012). Osa Johnson filed a $502,539 lawsuit against Western Air Express and United Airports Company of California, Ltd. (builder and owner of Burbank Airport, in 1937 a United Airlines subsidiary) for allegedly causing the death of her husband. Even though the crash was ruled pilot error, she lost on appeal in federal court on June 30, 1941. James Braden Killed Cleveland, Ohio President, Braden-Sutphin Ink Co.
E.E. Spencer Killed Chicago, Ill. Stromberg Electric Co.
H.H. Hulse Survivor Chicago, Ill. Stromberg Electric Co.
Lita James Survivor Los Angeles, Calif. Jameson Petroleum Co.
WX Flight 7 had a Salt Lake — Las Vegas — Burbank — Long Beach — San Diego itinerary. There is some question as to whether the aircraft was a Boeing 247 Model B or Model D. The crash report and certain other sources identify it as a 247-B. However, according to the Boeing 247 book, which references Boeing Aircraft Co. files in Seattle, the 247-B was designed in 1932 but wasn't actually produced. The same source indicates that the 247-D had a distinctive, rear-swept cockpit windshield — a feature seen in some of the photographs of our crashed plane. Additional characteristics of the 247-D (the first major production modification of the 247) are geared Wasp engines and NACA cowls. The modification was approved Dec. 14, 1933, and 15 were built. "Our" plane started life as a standard Boeing 247, tail number NC13315, construction number 1696, on April 29, 1933 — not long after the first Boeing 247 flew on Feb. 8 of that year. ("Aircraft Wrecks" incorrectly identifies it as NC13306.) NC13315 was initially registered in the name of Boeing Air Transport. The Air Mail Act of 1934 prohibited aircraft manufacturers from owning airlines that carried mail, so Boeing spun off a new company, United Air Lines. Like others in the fleet, NC13315's registration was changed to UAL on May 1, 1934. Then, on June 13, 1935, it was registered to Western Air Express, a spinoff from TWA. According to the Boeing 247 book, Western Air Express actually leased NC13315 from UAL beginning Dec. 23, 1934, and purchased it either on June 13, 1935 (per UAL) or on July 3, 1935 (per Western). We don't know exactly when NC13315 was converted to a 247-D, but it was likely around the time Western acquired the plane from UAL. LW2784a: 9600 dpi jpeg from original photograph purchased 2015 by Leon Worden.